Easy Cheesy Garlic Muffins - Soft, Savory, Buttery, and Full of Flavor! 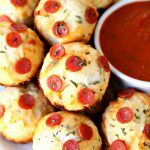 Easy Cheesy Garlic Muffins - Soft, Savory, Buttery, and Full of Flavor! Delicious and soft buttery Garlic Muffins – An easy cheesy recipe the entire family will love! Serve with pizza sauce for the perfect appetizer or enjoy with your favorite pasta dish. Preheat oven to 450 degrees. Spray muffin pan with nonstick cooking spray. Open biscuits and cut each biscuit in half. Flatten each biscuit half and press into a circle. Place 2 pieces of mozzarella cheese in center of each biscuit and roll into a ball. In small bowl, mix oil, butter, and garlic with spoon. Roll each dough ball in garlic butter mixture and place in muffin pan. In a separate bowl, mix mozzarella cheese, Parmesan cheese, and Italian seasoning. Sprinkle 2-3 tablespoons of cheese mixture over each dough ball. Add mini pepperonis. Let cool for a few minutes before moving to cooling rack. Serve with marinara sauce.